Tzortzis Rallis is a Greek graphic designer based in London. 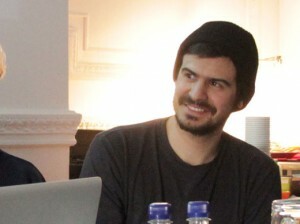 He supports grassroots political collectives in Greece, he is the co-founder of the Occupy Design UK collective and co-designer of The Occupied Times of London, the independent, not-for-profit newspaper born out of the Occupy movement – dedicated to socio-political, economic and environmental justice. With his work, workshops and lectures, Rallis exercises criticism of his own discipline and questions the contribution of design to the contemporary political and social context. In his personal activity, he uses visual communication skills to engage in social and political initiatives. He studied graphic design and fine arts in Greece, Spain and UK.